My user name does not appear on the login screen. There are two users and only one is shown. Is there any way to see the other user or some user name input box instead of selection? Press Option + Return on the keyboard. This should bring up the username and password fields on the login screen. If you can't login with the only user available on the interface, I presume you don't know the password? Start with your install disk (reboot with Alt, go to Terminal from the top menu, and type resetpassword. 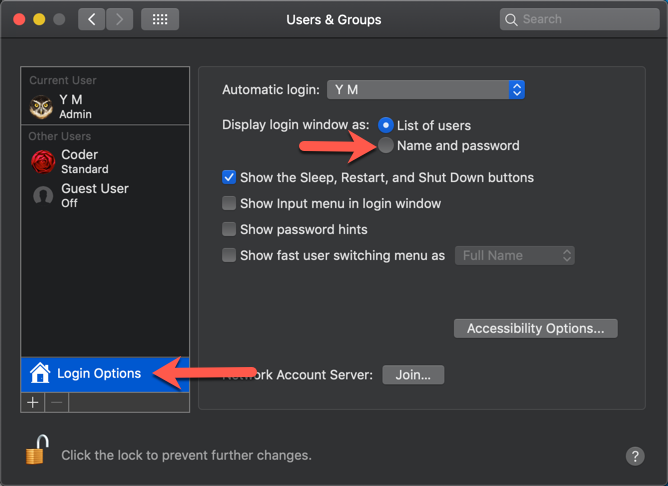 Go to "System Preferences" > "Users & Groups"
Click on the Lock at the bottom left (to unlock changes). Select "Name and password" instead of "List of users"
However, if you can't login with "List of users", chances are you won't be able to login with "Name and password" option either. You may check your user accounts on that same panel for examination. Not the answer you're looking for? Browse other questions tagged macos user-account login-screen . How to make the login window display list of users and name and password?